Your opinion matters! Please take a moment to complete our Fixed Route Customer Satisfaction Survey. Town & Country Transit (TACT) provides fixed route bus ride service to residents in the greater Kittanning and Ford City areas and shared ride service to all Armstrong County residents. We operate transportation services Monday through Friday from 56:30 a.m. until 7:25 p.m. and Saturdays from 8 a.m. until 4 p.m. TACT does not operate service on Sundays and holidays. Seven municipalities are members of TACT including Applewold, East Franklin, Ford City, Kittanning, Manor, Manorville and West Kittanning. These member municipalities govern TACT by serving on our Board of Directors and support us financially by providing funding to our agency. Armstrong County is also TACT's partner. The County provides funding annually to our agency which helps us to get additional money from the Pennsylvania Department of Transportation, TACT's primary funding source. PENNDOT funds TACT through grants and Pennsylvania Lottery funds. These funds allow TACT to provide fixed route bus and shared ride service to all of the citizens in our community. 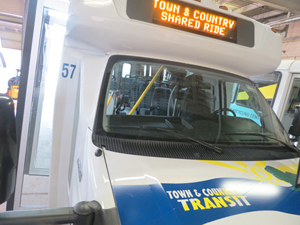 The vision of Town and Country Transit (TACT) is to provide safe, affordable, and reliable transportation services that meets the needs of all residents of Armstrong County by providing access to healthcare, education, employment, public services, and shopping. Through partnering with other community agencies, careful stewardship of public funds, and provision of efficient service, TACT will continue to improve the quality of life for its valued customers. 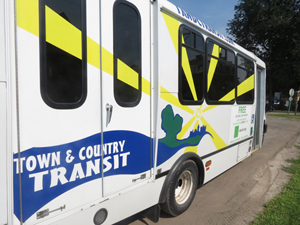 The Mission of Town and Country Transit is to improve the quality of life for the residents of Armstrong County through a coordinated, accessible, affordable, safe, and efficient countywide transportation system. Schedules and service information for each route can be found by clicking the Route Tabs at the top of every page. You can also pick up a schedule at TACT's office, the terminal or call our office for one of the 18 other places throughout the area timetables are available. TACT has the following policy regarding carts, strollers and carry-on packages. All items are not permitted to block aisles or doors. No large items are permitted; all items must fit on their lap or under the seat. There is a limit of four small carry-on items. Hazardous or leaking items are not permitted. Carts and strollers must safely secured. Children are not permitted to ride in the strollers; they must be on the parents lap. Passengers will assume full responsibility for the safety of their child. Our complete policy is available here. TACT also provides a service called Shared Ride to all of the citizens in Armstrong County. Shared Ride is advance reservation, door-to-door service for senior citizens 65 years and older, and Persons with Disabilities (PwD) ages 18 - 64, and the general public. TACT also provides ADA Complementary Paratransit to all eligible persons with certified disabilities. Please contact us for more information. Please add me to your mailing list. Do not add me to your mailing list.